Relying on recent research by the World Health Organization, the Centers for Disease Control (CDC) have alerted travelers to new vaccination requirements for yellow fever. Nearly three dozen countries (see list below) have raised entrance requirements to include proof of vaccination for travelers who spend upwards of twelve hours in transit through countries with risk of yellow fever transmission. The CDC maintain a full list of yellow fever requirements and recommendations by country in the online 2012 Yellow Book. 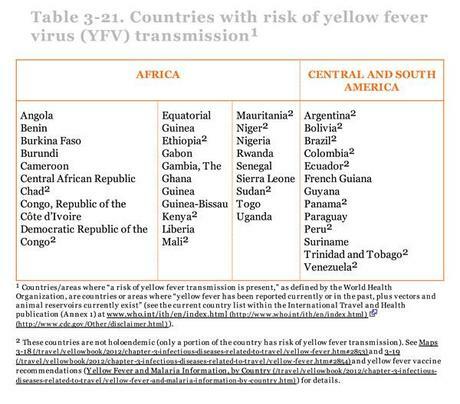 The below chart from the CDC shows the countries where a risk of yellow fever transmission is present.